During a Field Sobriety Test (or "FST"), a police officer who suspects that you have been driving under the influence ("DUI") asks you to do a series of very specific things, so that he can observe you doing them. The movements the officer requests range from following the tip of a pen, to walking a straight line, to standing on one leg. While you perform these movements, the officer is looking for specific behaviors that he has been trained to look for -- movements which mean that you are impaired and have been DUI. You can simply decline to participate in FSTs. Nothing in the law requires you to take the tests! As a condition of having a California driver's license, you are required to submit to a chemical test -- that's blood, breath or urine. You are not required to submit to any other test. So, why give the officer additional evidence? The officer is not looking for an excuse to let you go; he's looking for a reason to arrest you for DUI. Don't help him. Always be respectful, but inform the officer that you decline to participate in FSTs. He may arrest you anyway, and then you'll have to submit to a chemical test (you would have anyway) -- and that's a topic for another day. 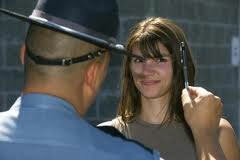 In the Horizontal Gaze Nystagmus test, the officer asks a DUI suspect to follow the tip of a pen, and the officer looks for a jerking movement of the eye. When someone has been drinking, the muscles in the eye become more relaxed, which causes an involuntary jerking movement when a DUI suspect attempts to look sideways. The problem is that this jerking movement can start to appear at a blood alcohol content ("BAC") of only .06%, while the legal limit in California is .08%. In fact, about 3% of people exhibit nystagmus when they are completely sober! Many police officers don't know when nystagmus can start, but when they see it, they're likely to arrest you. Another problem is that the test was validated by studies under very specific control conditions which may not be replicated on the side of the road, where you are being given the test. The stimulus (pen tip) must be moved fairly slowly -- at about 10 degrees per second -- but not too slowly; otherwise normal oscillation of the eyeball may be mistaken for nystagmus. In the Walk-and-Turn test, the officer asks a DUI suspect to walk heel-to-toe along a straight line, and then turn around and walk back. The officer is looking for a sway in the suspect walk, lack of balance and muscular coordination. The problem is that balance is effected by a large number of variables. Sleep loss, exercise, temperature increase, food intake, tranquilizers, and antihistimines can all effect body sway. As one example, increasing the temperature from 65-68 F to 79-86F can have a significant effect on body sway. Additionally, peripheral vision is very important in maintaining balance. People have naturally varying ranges of peripheral vision, and the police officer who suspects you of DUI has no idea what your normal range or peripheral vision is. He certainly knows nothing about your sleep habits, what you've eaten, or how much you have exercised recently. Similar to the Walk-and-Turn, during the One-Leg-Stand test, the officer is looking for body sway and the DUI suspect's ability to maintain the assigned body position, which involves balance and muscular coordination. Many variables can effect a person's ability to stand on one leg, including lack of sleep, nutrition, temperature, and recent exercise. An officer administering the test has no idea how these factors apply to you. The best way for a DUI suspect to attack the FSTs is to not do them at all. However, many people are likely to stumble on this article after it's too late for that. Fear not; we can use these same flaws in the tests to effectively cross-examine the officer at trial. If you or a loved one has been arrested for DUI, there are very short time limits on your ability to request a DMV hearing and avoid an automatic driver's license suspension. Contact a qualified criminal defense lawyer now! Sources and further reading: Development and Field Test of Psychophysical Tests for DWI Arrest (Tharp, Burns & Moskowitz, 1981); Psychophysical Tests For DWI Arrest (Burns & Moskowitz, 1977).